Want to keep a closer eye on the deliveries, guests, or prospective burglars frequenting your doorstep? Netatmo, purveyor of many a security camera, are expanding their smart home range with the new Netatmo Smart Video Doorbell. Announced for the start of CES 2019, the smart doorbell comes with a 1080p Full HD camera comes and 160-degree wide angle lens, alongside a range of smart recording and detection features for keeping your home feeling secure. Netatmo uses 'people detection' to alert you when figures appear at your door, without raising the alarm every time a dog runs past or a leaf falls onto your driveway. An infrared camera will also keep faces visible even at night. When rung, users can receive a video call through the Netatmo Security app on their smartphone, tablet, PC, or Apple Watch - though you can adjust notification settings to choose how you're contacted. The reason you might choose this smart doorbell only any other, is that it's the first to work with Apple HomeKit. With this, you can control the doorbell using Siri voice controls, or by connecting the device in tandem with other smart home products – like turning on the porch lights when a potential intruder is outside. Smart home manufacturers like Netatmo are cottoning onto the convenience consumers expect from their purchases these days. The smart home video doorbell can be easily installed without a trained electrician or DIY expert, allowing you to simply unscrew or remove your existing doorbell and link up the same wired connection (anything from 8-24V to 230V). 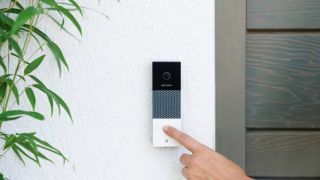 The doorbell then connects to your home Wi-Fi, to be controlled over the Netatmo Security app, and will even keep the same ring-tone or jingle your home doorbell had previously.